This Quick Start automatically deploys Trend Micro Deep Security on AWS, using AWS services and best practices. Trend Micro Deep Security is a host-based security product that provides Intrusion Detection and Prevention, Anti-Malware, Host Firewall, File and System Integrity Monitoring, Log Inspection, and Content Filtering modules in a single agent running in the guest operating system. This Quick Start deploys Deep Security using AWS CloudFormation templates and offers two license models: Per Protected Instance Hour and Bring Your Own License (BYOL). You can also launch the Quick Start with either licensing option in the AWS GovCloud (US) Region. The default configuration protects instances in the VPC where the Deep Security Manager is deployed. After deployment, you can modify your setup to protect instances across your entire AWS infrastructure. The Quick Start deploys Trend Micro Deep Security into an existing virtual private cloud (VPC) in your AWS account. Before you launch the Quick Start, you must create a VPC that has two private subnets in different Availability Zones, and one public subnet with an attached internet gateway. In the public subnet, a Deep Security public elastic load balancer. In the public subnet, Deep Security Manager instances. In the private subnets, a highly available Deep Security database and its mirror. 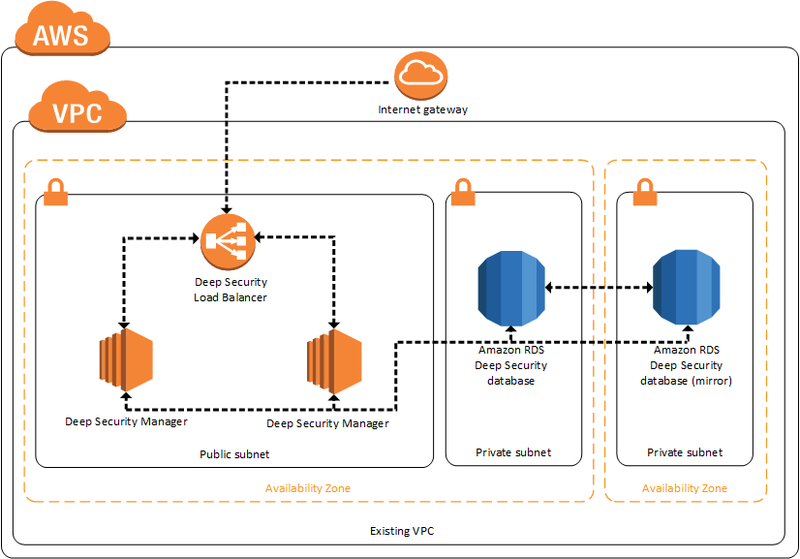 The Amazon RDS database server used by the Deep Security Manager is deployed across two Availability Zones (where available), providing high availability at the database layer. The AWS security groups created by the template are configured to only allow traffic that is required. If you don't already have an AWS account, sign up at https://aws.amazon.com and set up your VPC. The VPC must have two private subnets in different Availability Zones, and one public subnet with an attached internet gateway. Subscribe to Deep Security, choosing the Per Protected Instance Hour or BYOL licensing option. Log in to the Deep Security Manager console. Deploy agents to protect your instances. You are responsible for the cost of the AWS services used while running this Quick Start reference deployment. There is no additional cost for using the Quick Start. The cost of the resources created by the Quick Start varies based on how many instances you want to protect. Prices are subject to change. See the pricing pages for each AWS service you will be using in this Quick Start for full details. Per Protected Instance Hour is a consumption-based option that allows you to pay hourly per protected instance. Your costs will be determined by the number of instances you are protecting each hour, and will show up on your AWS bill. Bring Your Own License (BYOL) is a perpetual licensing option for organizations that prefer traditional procurement. Please contact Trend Micro for a license key at aws@trendmicro.com. The Quick Start has been designed to support deployment of up to 2,000 protected instances. If you are protecting more than 2,000 instances, please contact aws@trendmicro.com for free assistance with additional deployment options.